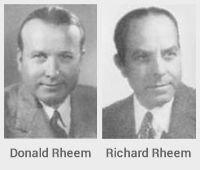 Rheem Manufacturing Company was established in the mid-1920s when brothers Richard and Donald Rheem acquired a galvanizing plant in San Francisco, California. In the 1930’s, Rheem began manufacturing water heaters, and by 1936 had coast to coast distribution. During the 1940s and 1950s, the company increased its product line to include space heating units for homes, oil furnaces and air conditioners. In 1959, Rheem acquired Ruud Manufacturing Company, a pioneer in the water heating industry with a well-regarded product line and a distribution network throughout North America. In subsequent years, Rheem entered the heating and air conditioning market and expanded in the late 1960’s and 1970’s with the rapid growth of the central air conditioning industry. In 1985, the company acquired Raypak, a leading producer of copper tube boilers used for swimming pool heating and commercial hot water supply and hydronic heating. Respected For Reliability, Rheem is an industry leader for total heating, cooling and water heating solutions. In fact, Rheem is one of the few global brands with product offerings covering residential and commercial heating, cooling, conventional and hybrid storage-style water heaters, tankless water heaters, solar water heating systems, hydronic and geothermal systems, indoor air quality accessories, and replacement parts for all categories – making Rheem a one-stop Air and Water comfort solutions provider. All Rheem products meet or exceed rigorous industry and regulatory standards for quality, reliability, efficiency, and air & water quality. From design and fabrication to finished product assembly, each phase in the manufacturing process is rigorously monitored and measured to ensure the highest quality , durability and operating excellence. Rheem products are routinely tested and certified by various government and third-party testing labs to ensure quality standards. Rheem is headquartered in Atlanta, Georgia. It manufactures in Fort Smith, Arkansas; Montgomery, Alabama; Oxnard, California and Eagan, Minnesota. All manufacturing facilities are ISO 9001 certified. Rheem operates a state-of-the-art Parts Distribution center in Randleman, NC and distribution facilities throughout the US and in Brampton, Ontario, Canada. Rheem also has an international presence in countries such as Australia, Canada, Mexico, Brazil and Singapore. In 1988, Rheem became a wholly owned subsidiary of Paloma Industries of Nagoya, Japan, the world’s largest producer of gas appliances. Well Known For Quality Rheem is the industry leader for total heating, cooling and water heating solutions. In fact, Rheem is one of the few global brands with product offerings covering residential and commercial heating, cooling, conventional storage-style water heaters, tankless water heaters, solar water heating systems, replacement parts and accessories for all categories – making us a one-stop solutions provider. All Rheem heating, cooling and water heater heating products meet and exceed rigorous industry standards for quality and reliability. From raw material delivery to finished product assembly, each phase in the manufacturing process is effectively overseen to ensure the highest quality in water heater manufacturing. Rheem products are frequently tested and certified by various government and third-party testing labs to ensure quality standards. Wide Range of Heating, Cooling & Water Heating Solutions Today’s economy isn’t about product lines; it’s about product solutions. It isn’t about the number of models or the capacity, but how you can use these various products to meet the equally various demands of each application. Residential, commercial, institutional, industrial and manufactured housing. Whatever your interests or needs; whatever your heating, cooling or water heating application, Rheem has a reliable, cost-effective solution to meet it. Rheem is your one-stop source for all your heating, cooling and water heating needs.